Growing up I can’t say I was an outdoor kid. In fact, much like now, you were more likely to catch me reading a book than sitting by a campfire. As I grew up I really began to be interested in the peaceful feeling of being outside; the gorgeous sunsets, the sounds of a busy forest, and of course campfire foods. Throughout college as a poor college student, vacations were few and far in between. Little weekend jaunts here and there really. But one thing my husband I really loved, and fit right in our budget, was camping. I can remember many weekends away setting up a tent or hiking through the woods. And now, while I am not a fan of ground sleeping, you will still catch us heading up the cabins for some rest and relaxation. 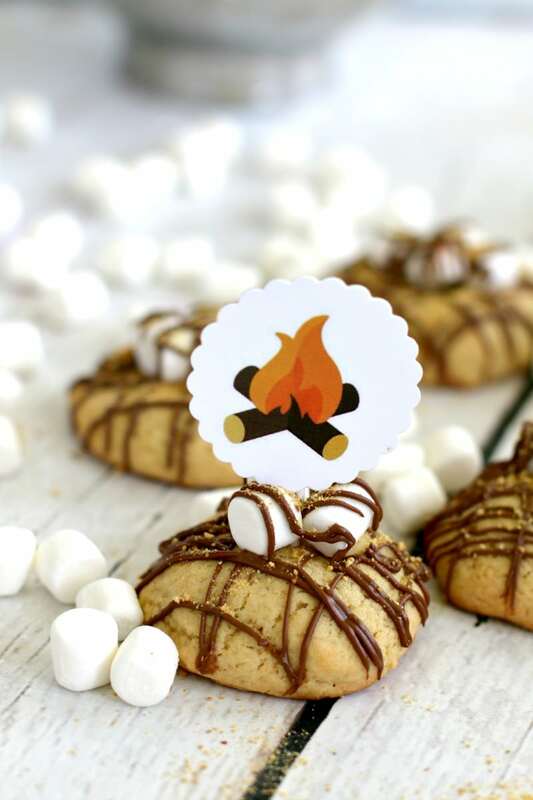 That is why I am so excited to bring to you this gorgeous, fun, and tasty campfire cookie. Made with the “Make it Yours” cookie recipe, it’s such an easy cookie to custom make! First, use the Make It Yours Cookie recipe by Country Crock to create your dough base. Wrap the simple dough over marshmallows stuffed inside, which bake right into the cookie. This will make the result soft and with just a hint of gooey marshmallow taste. Once cooled, top with more marshmallows (can’t have enough!) and cover in a chocolate drizzle. Before serving, sprinkle with fine graham cracker crumbs to top it off. It’s a campfire in every bite! The sheet has 12 cupcake toppers that look like a little campfire. Simply add them to a toothpick and pop right on your cookies for a perfect set up. This free sheet also pairs nicely with this Campfire Invitation and this Scavenger Hunt sheet, both of which you can download (FREE!) here to complete your party. Want to see more recipes? Follow my journey this year on the Meal Inspirations Page for the Walmart Food Hub here!